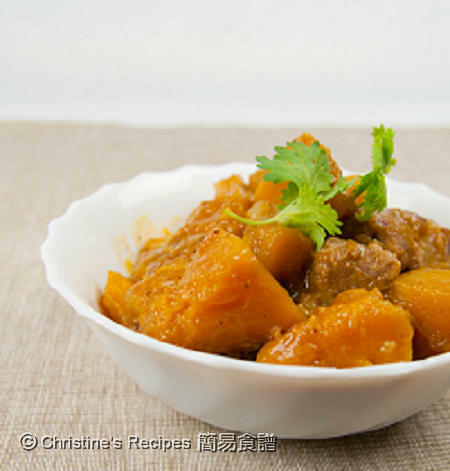 Pork and pumpkin are good partners to produce an appealing dish. Here it’s one of my favourite dishes, Braised Pork Ribs with Pumpkin. Whenever I go shopping for groceries, I’d often buy a pumpkin back home because their shape and colour are beautiful, taste heavenly sweet, as well as they are rich in antioxidants, vitamins, and minerals. After moving to Australia, I have been addicted to eating pumpkin whether it’s cooked in Western or Asian way. There are several different kinds of pumpkin? Which kind is the best? One of my friends said that butternut squash is the best. Yeah, I agree with her. For me, it’s also the best kind to bake in an oven. When it comes to cooking them in Asian way, I just feel the Jap/Kent pumpkin is the most suitable for being braised with meat. Here it’s one of my favourite dishes, Braised Pork Ribs with Pumpkin. Just a side note, I found lots of Chinese food blogs out there that are praising the combination of pork and pumpkin. It seems that pork and pumpkin are good partners to produce an appealing dish. Do you like eating pumpkin? Which kind of pumpkin do you like the most? Rinse pork ribs and drain well. Cut into chunks, about 1 1/2 inch in length. Mix with seasoning for 30 minutes. Cut pumpkin into 2-inch chunks. Heat oil in a wok or deep frypan. Sauté black bean garlic sauce over medium heat until aromatic. Add pork ribs and cook until lightly brown. Add hot water, just cover the pork ribs and bring it to a boil. Simmer on low heat until tender. Test it with a chopstick. You can insert a chopstick into the meat easily, then it’s soft enough. Add pumpkin to cook until softened. Replenish hot water if necessary. The amount of water you add depends on how high the power of your stove. And the cooking time would also depend on how soft the pumpkin you like. Yet, don’t overcook the pumpkin. When all ingredients are cooked and softened, about one third of water left with pork and pumpkin, pour in thickening and cook the consistency to your preference. Dish up and serve hot. You can keep the skin of pumpkin intact and cook with pork ribs if desired. Great taste and more nutrients you may enjoy then. Don't throw the pumpkin seeds away. They are goodies. You can rinse and drain them well. Let dry overnight. Place pumpkin seeds on a greased baking pan and bake in a preheated 170C (350F) for 10 to 20 minutes. Eat them as they are or bake cakes or muffins with them. In this cold weather it's perfect! Hmmmm....maybe I should try but I hate pumpkin though. This dish would be perfect for the cold temp right now, warm and soothing. Oh my, I love the look of this dish. Never would have considered paring that on my own which is why I love to stop by - you are such an inspiration with some great ideas. Easy, I plan to try this one tomorrow. Will let you know how it comes out. Looks luscious! Whenever I make pumpkin ravioli I prefer to use Japanese... but to be honest, I really have to learn the differences between them all! That looks very delicious. I'll have to cook more rice if I cook this. That looks super comforting! I have never tried braising pumpkin and pork together. Must give it a try one of the days. That's a great combination. This could be part of our everyday meal as Asian flavors dominate this household. I love butternut squash too but the most popular one that we have and the cheapest one are the regular pumpkins. Never had pumpkin with pork. This sounds tasty. I love Japanese pumpkins - I recently used one for a pumpkin cheesecake. And Pumpkin molasses bread. (it was a big pumpkin) I also love butternut, usually moreso for savory dishes. Might have to think outside of my pumpkin box and try something like this! Oh I know what we are having for dinner tonight. I have never thought of combining pork and pumpkin, but is sure sounds wonderful. Thanks for stopping by my site, The Saucy Gourmet, I look forward to sharing with you! For awhile I thought it was curry...looks so good! Lovely recipe! This is a good reminder for me to not just remember pumpkin around the holidays. We'll roast other squash like butternut or acorn, but pumpkin is often overlooked. And even the plain canned pumpkin is great -- sometimes I'll mix some of it with ricotta cheese and make ravioli filling or use it for a creamy white sauce lasagne. Sometimes I am just confused by the variety of pumpkins they have out there. I just got a pumpkin from the market over the weekend. Going to so a simple stir-fry. I bet your dish is very tasty. I love pumpkin whether it's in the form of desserts or savoury side dishes! I am from Malaysia;hence, I always eat the local Malaysian pumpkin as it is much cheaper compared to the ones imported from abroad. =) I've made stir fried pumpkin with dried shrimps before and I think they are also a great combination besides pumpkin and pork. I tried this dish with butternut squash and it was sooooo delicious!!! Thanks for the recipe! I like this pork rib, it is very easy to prepare. I didn’t use the whole pumpkin to contain the ribs( I thought this is the traditional way). The pumpkin was diced into small cube and mixed in before cook in. The seasoning ingredient of this dish is sesame oil, pepper, wine, soy sauce and chicken stock. All the ingredients are accessible locally. Just been told to try this recipes to cooked tonight..i did once but not like this kind of ingredients...mmmmm hope my boss will like it !!! and think it's really good taste as i love pumpkin! Made this for dinner today and it was sensational . Thanks! this is so yummy.... I am going to try this. Thanks Christine for this recipe, I cooked it - its so simple and yet so delicious. How would this be converted to instant pot?? Just cook the pork ribs in your instant pot first. Then add the pumpkin later as it needs less time to cook and get softened.